It helps to make a list of everything you wish could be done to keep your house clean. Take several days to really think it through, writing down every job from the simple things like wiping the toilet to the larger, seasonal jobs like cleaning the walls. Next, take your list and decide when you’ll actually accomplish each task – daily, weekly, monthly, seasonally, or annually. You can find an exhaustive list in the book Home Comforts, by Cheryl Mendelson. Decide who will do each chore. Be sure to include your children. They need to learn responsibility and life skills, but it’s also good for their hearts to help their family members with a good attitude. Use a chore chart so there is no confusion about jobs. You will have to be consistently “tough” when establishing new cleaning habits. If you’ll require each person to make his bed as soon as wakes up, for instance, it will soon become as natural as brushing his teeth. Until then, though, it’s up to you to be sure all jobs are done. Make your bed as soon as you get up. If you start your day with this simple chore, you’ll be more likely to keep the rest of the house clean, too. Put all the dirty clothes into hampers as soon as you take them off, rather than throwing them on the floor or in a closet. If you’ll sort your clothes immediately, you’ll save time. Wipe the bathroom counters, sinks, and toilet every day after you take your shower. Clean up the kitchen immediately after each meal, so that dirty dishes don’t pile up. Wipe the table, countertops, and stove right away, too. You’ll be discouraged if you procrastinate, because all the mess will harden and be much more difficult to clean later. Never, ever go to bed with a messy kitchen! If you have a busy household, vacuum and sweep high-traffic areas every day. Pay special attention to areas around the doors and eating areas. Only touch a piece of mail once, immediately sorting it into categories such as “bills,” “to do,” or even right into the trash can. Require your children to clean up their toys before playing with something new. Small messes are much easier to put away than large messes. Set rules about where family members eat. Only eating in the kitchen or dining room will save your furniture, carpet, and walls from stains, crumbs, crease, bad smells, and pests. 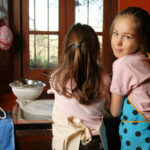 Help your children learn that preventing a mess is a way to show love to the owner of a home. I like thoroughly cleaning my home one day per week. Others prefer to divide all their household chores over six days, so that they only have to do a little each day. Divide the chores among all the family members, and spend time cleaning together. Work is always more pleasant when shared. Have supplies handy on each level of your home, so that you don’t have to climb stairs to get a rag, spray bottle, or dust pan. Wear an apron while you clean, so you can put stray toys in the pockets or carry some supplies with you. Clean in a circle around the room, from left to right and from high to low (to knock dust down). Clean as quickly as possible. Set a timer and race yourself. When a room is done, spray essential oils into the air, light a candle, or put a flower into a vase, to give you a “well done” feeling. Choose one room each month to completely organize and thoroughly clean. Spend a short period of time in this room each week throughout the month, and by the end, it will look great. Have a designated box or plastic container for giving things away, to help you continually simplify. As soon as you realize something is too worn out to keep, throw it away immediately. If you no longer need it, put it in the “Give Away” box immediately. If you aren’t using it but are sure you’ll use it later, put it in the attic or garage today. If you haven’t used it in a year, say goodbye. We enjoy deep cleaning our home before major holidays, such as Passover or the Feast of Tabernacles. It’s especially meaningful at Passover to look in every corner and under every bed for dirt and leaven. What ideas and suggestions can you add?